I have no flower or garden pictures to share today, nor new home decor...the usual stuff I post on Sundays. But I do have some tidbits of my normal, boring, daily life I'd like to share since Sunday's are also reserved for lifestyle posts. First up, here are some pictures I never posted that were taken back in November. We went to Alma, Wisconsin to see the tundra swans (except it was such a warm fall, they weren't there yet) and ended up never seeing a swan, but only a bunch of ducks...and something else swimming in the water, but we couldn't figure out what that was, an otter or beaver perhaps. Anyhow, because we never saw a single swan, I could hardly do a post on "Tundra Swans" now could I? I still took advantage of the beautiful backdrop and the setting sun and had my husband take a few fashion photos while we there. You can see those photos HERE if you missed it. But when my husband was done taking my photo, he decided to be the fashion model for a change and let me be the photographer. Not bad eh? Looks a lot like a lot of the other fashion bloggers I see on the web. He has the pursed lips and stance down perfectly. And yes, he is wearing my sunglasses and holding my IPhone. Of course, he couldn't use it to save his life! :) What a shyster! He never fails to make me laugh, every single day. Now what else have I been up to? Well, as soon as my house was empty of holiday guests, I started taking down the Christmas decorations, cleaning up, and decorating for Valentine's Day! After that, I began my next big project: redecorating my son's old bedroom. I never really got "Before" pictures, because it was half dismantled already when he moved out and took most of his possessions with him. But I do have a few on a old post HERE if your interested. However, I do have work in progress pictures! This wall was where his old bed was. It was a built-in bed; where you see blue paint is where the head board was. The room was painted a beige on top of the wall above the chair rail and a sponged darker blend of beige's below the chair rail. On the opposite side of the room is a closet and an old shoe rack where I kept my brown, black, and winter shoes while Jordan was away at college. I started using the room as extra storage when it sat empty most of the year and he only came home for breaks and summer vacation. On this wall is the doorway. Opposite of this wall are two large picture windows. It is a very tiny, tiny, room: just big enough for a twin size bed, a dresser, and a desk. It would probably not even be considered big enough for a small walk in closet by today's standards. After my husband ripped the old bed and closet shelf out, my job began: painting! Ugh! I hate to paint! It took me all week to paint this tiny room! I first started with a coat of primer and got sick to my stomach from the fumes...even with the windows open! I had the hardest time picking a color for this room. Don't you just hate picking a paint color? It's sooooo hard! I got so many different opinions from people, but that just made the decision process even harder. My daughter wanted me to paint it Blush. My husband wanted me to paint a stripe of pink and gold. Ugh! "Too much work" I said and there will not be much wall space showing to make it worth it when were done adding the closet built ins and daybed. I finally settled on the Pantone color of the year Rose Quartz...although, I really couldn't seem to find that exact shade so I picked Hawaiian Shell by Pittsburgh Paints. Close enough, I thought. I got it up on the wall and thought "Oh my gosh, it looks like someone puked Pepto Bismal all over the wall!" Well, after three days of painting and $34.00 dollars for a gallon of paint, I was not going to re-do it. The reason is, the closet is going to covered up with a drape. The pink wall you see in the photo below will be white closet built-ins. The only pink you will see when it is done will be a little up on top of the built-ins. The other side is mostly windows...which means more drapes. And the opposite side of the room is the bed, so the only pink you will see over there will be the angled ceiling above the bed. "It will be fine!" I reassured myself. Now, if your wondering why I painted this room pink and what I am going to do with it, I am turning it into a combination walk-in closet/dressing room/guest room. I want the room to very girly, Zsa-Zsa Gaborish, very glam, frilly....over the top feminine! Hence, the pink! After a week covered in pink paint and wearing grubs, I told my husband "Well, my job is done. The rest is yours to do!". I was SO HAPPY to pass the reins off on this household project! He has to make the built-ins and the bed, and finish off the closet. I will have a TON of sewing when his part is completed, so I'm really not done, done, but I'm done enough for now. However, there is a lot of shopping to do for this new room! But that's the fun part. I've already started looking for fun decor to fill this room and picked up a few things like some pretty silver bowls for throwing jewelry in, and a lovely table mirror with rhinestones. But I also have to find fabric for the closet drapes and curtains as well. Currently I am on a hunt for a elegant white bedroom vanity. Because we didn't have our "Monthly Adventure" yet, we decided to go antiquing this weekend. We drove to every antique shop within an hour of our home in all the quaint towns of Alma, Wabasha, Red Wing, and Lake City...and not a single antique shop had a vanity I liked. It was so disappointing. But it was still fun looking! The day wasn't a total waste however. I did find this amazing tea kettle for only $3.99!!!!! I have been looking for one forever! Can you see my reflection in the pot? Isn't that funny? My tummy looks so round! And our biggest score of the day....Hush Puppies shoes at 70% off! The Hush Puppies shoe store in Red Wing, Minnesota is going out of business so all their shoes are 70% off! I feel bad for them, but happy for me. These shoes are normally unaffordable for me! I tried a pair on in the store, sighed, and then said to my husband "So this is what the feet of rich people feel like." Oh, my feet never felt so good. I bought one pair of Merrell Hiking Boots and a pair of Merrell sneakers and paid about $32.00 each. My husband bought four pairs of shoes...yes four!!!! He never buys anything for himself, but he has so many problems with his feet and he never buys good quality shoes because he can't stomach the prices. But when you can get shoes that normally cost over $100 for $30....he decided to stock up! Good for him! When we left the store, we had four bags of shoes totaling over $650.00, but only spend less than $200.00. Amazing! Well by now we were hungry so we stopped for dinner at our favorite Mexican restaurant in Red Wing. 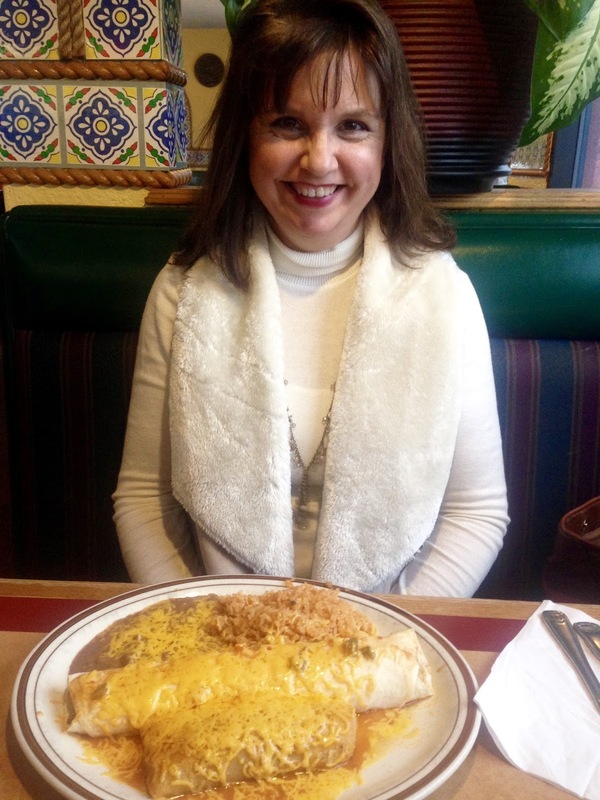 We both ordered the special of the day: a burrito, enchilada, spanish rice, and refried beans for $8.00. It was o.k. There were no vegetables inside...just the meat, and also no sour cream. So I only ate half of it, and took the rest home. I'll have the rest for lunch on Monday, but this time add lettuce, tomato, olives, and sour cream! Well there you have it, my normal, boring life. Did you fall asleep yet? LOL! I think it's important in blog land to do a daily life post every now and then. So often when you see only the highlights of a person's life, you think their life is nothing but vacations and beautiful clothes. But most of my week I am home alone crafting, cleaning, cooking, or gardening and wearing grubby clothes and no make up. And I couldn't be happier doing that! There is nothing more magical than a perfectly normal, ordinary day. The pink looks nice, and I am sure once you have it all set up it won't remind you anymore of pepto bismol. Visiting antique shops is always so much fun! Hope you'll be able to find the furniture piece you are looking for! I bet the mirror with rhinestones looks beautiful! Great deal on the shoes! !